Tired dogs are happy dogs! Most dogs with behavioural issues, such as destructive behaviour, barking and escaping, simply have too much energy and not enough things keeping them busy. 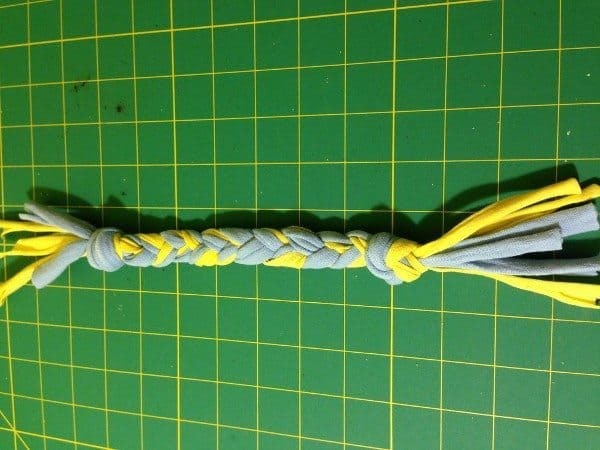 If you are at work all day or you have a dog that could do with some mental exercise as well as physical exercise, there are some great boredom buster toys you can buy or make yourself, to keep your furry friend occupied. For a great use of an old T-shirt, upcycle it by cutting it into strips and braiding it into a tight plait. Instant dog tug toy! 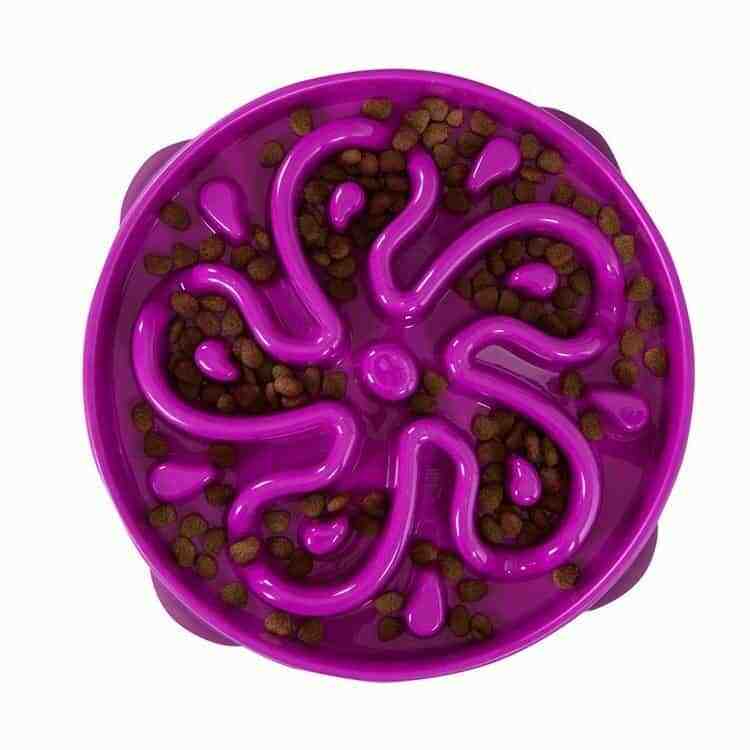 Tennis ball treat puzzles are brilliant for those dogs that like to problem solve and chew. 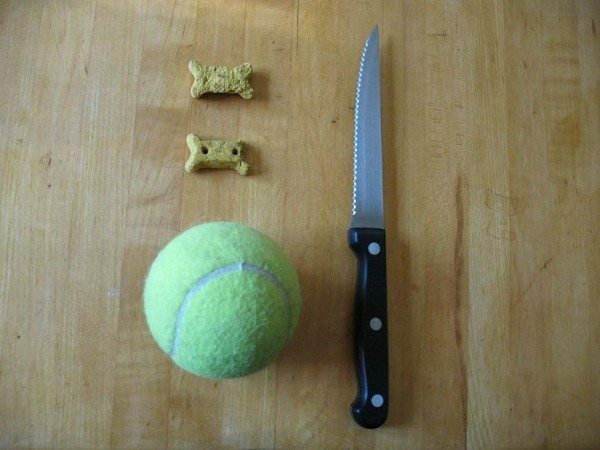 Simply use a sharp knife to cut a slit in the tennis ball and pop your treat inside. As your dog chews, the hole should open to reveal the treat. 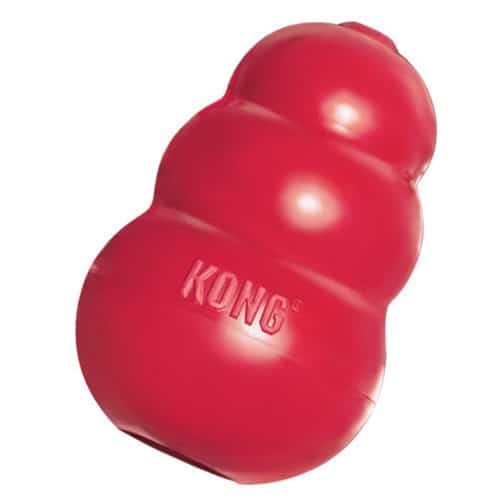 Kongs can be great for chewers. Chewing is an excellent stress-reliever for pets and leads to the release of feel-good endorphins. For long-lasting fun, fill the Kongwith something yum like peanut butter or sweet potato, and pop it in the freezer for a few hours until frozen. You can also fill it with your dog’s regular dry or wet food. Ideally get a few Kongs and rotate them, so they seem novel and exciting. 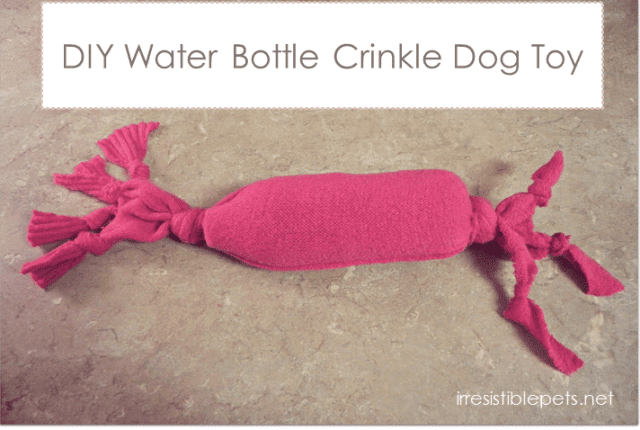 This is a great easy-to-make toy from something we all have around the home: an old plastic bottle. Many dogs love that crinkly, cracking sound of chewing on a plastic bottle. But always remove the lid and the plastic ring around the neck before giving a drink bottle to your dog. Be careful to supervise those serious chewers, as plastic can easily form sharp corners that can cut delicate gums and if pieces come off they can easily be swallowed. Feeding from a bowl is a bit of a wasted opportunity for fun. 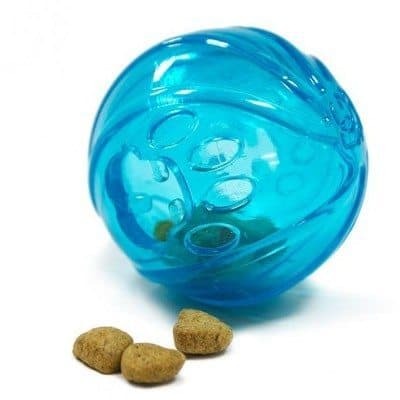 You can put your dog’s breakfast in a special treat ball that must be rolled around to get the food out. Hot day? 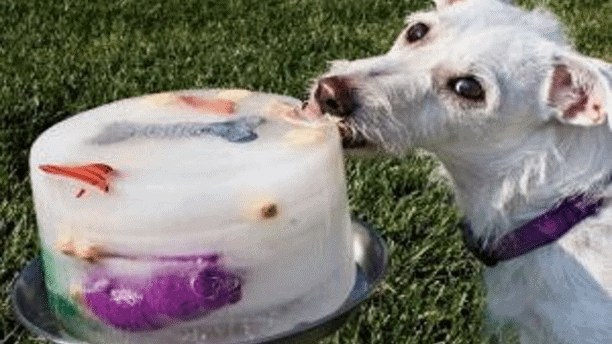 Make your dog an ice block using an old ice-cream container. Either freeze some broth or onion-free stock then leave it out for your dog to feast on, or hide a chew or toy within a block of ice so your dog can work at it during the day. 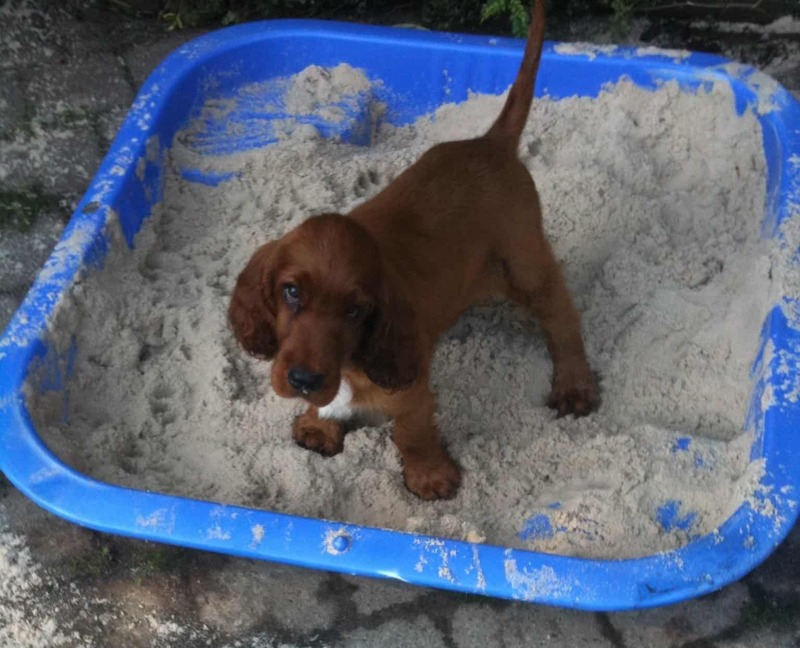 You can also experiment with hiding your dog’s food around the house or using a slow feeder bowl – anything that makes food last a little longer and makes it into a bit of a game will keep your pooch occupied. If you have an outdoor area (or you don’t mind sand all over the place), you can set up a digging pit using a children’s clam-shell pool. Hide some toys in there and Voila! a fun place to play. You can also fill it with water if your dog loves water. An old muffin tin can be used to slow down fast eaters or set up as a puzzle toy. Simply put the food morsels in the tin, then cover each hole with a tennis ball, or similar. Your dog needs to nudge the ball out of the way to get to the food. For dogs who love to tear apart their toys, always make sure they are not accidentally (or on purpose) ingesting pieces along the way. The surgery to remove a foreign body is costly and dangerous for your pooch and is easily avoided by ensuring you only give your determined chewer safe toys or supervise them closely. That being said, chewing is great for the mind and soul of a dog, as well as those pearly white teeth!